Former mayor of Bogota Enrique Penalosa has been a champion for building equitable cities. Photo by Colin Hughes/Flickr. 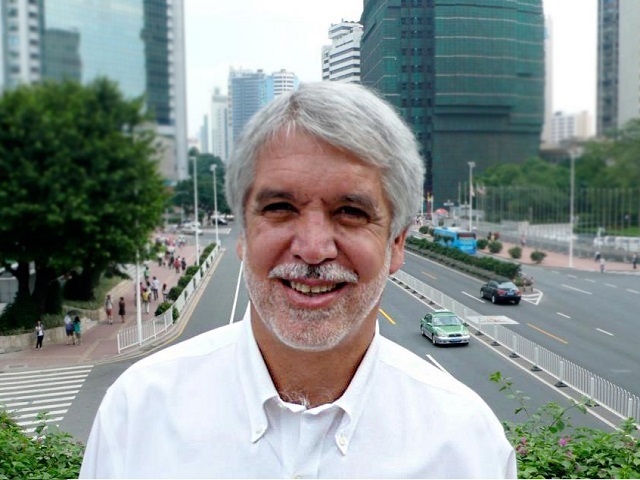 Enrique Peñalosa, Bogota’s former mayor, will come to Rio de Janeiro, Brazil on September 9 for the Mayors´ Summit. The event is hosted by WRI Brasil | EMBARQ Brasil as part of EMBARQ Brasil’s 10th anniversary celebration. Here is an exclusive interview for TheCityFix and WRI Brasil | EMBARQ Brasil. While mayor, you were responsible for numerous and sometimes radical improvements in the city. Which one brought the most happiness to people? Enrique Peñalosa (EP): We have made a city much more for people and less for cars. I took tens of thousands of cars off the sidewalks and we made new sidewalks. We had TV commercials explaining sidewalks are for talking, for playing, for doing business, for kissing. We´ve started a sidewalk revolution. TransMilenio, the BRT system, was also a very powerful equality symbol because we took space away from cars to give it to public transport. And for the first time we had the people in public transport going faster than those in cars. It shows there is democracy; it shows all citizens are equal. We created the Alameda El Porvenir – maybe the achievement I am most proud of – which is a bicycle highway 50 meters wide and 24 km long that thousands of people use every day to go to work. In addition, we built the Juan Amarillo Greenway which links the richest parts of the city to some of the poorest parts. We began to build extremely high quality schools in the poorest neighborhoods with very high quality libraries to show that knowledge is more important than wealth. Which improvements brought the most headaches for you? EP: The most important thing is to realize that we did what nobody else would have done. It was a completely new concept, new ideas. So we had a lot of conflicts. Maybe the most difficult one was to get tens of thousands of cars off the sidewalks. There were even some people who started collecting signatures in order to impeach me. To implement the bus system we had an enormous war against the traditional bus operators and they went on strike, they brought the city to a halt. There was also a huge war to create parks because many parks had been gated by the private sector. We also had a war when we recovered the central area that had been taken by drug dealers – an area just two blocks away from the Presidential Palace and from the central square, somewhat similar but a hundred times worse than Cracolândia in São Paulo. We had a war trying to build some public spaces and plazas that were completely taken over by vendors. The most exclusive country club, where the most powerful families were members, was expropriated in order to create a public park. You said “You dream of a tropical city, crisscrossed by large pedestrian avenues, shaded by enormous tropical trees, as the axes of life of those cities”. Were you able to achieve this city? EP: I was mayor for only three years and in Colombia there is no re-election in the constitution. Now, that time is longer, four years. I think the cities we have today – all cities around the world – are very wrong. We are so used to them that we think this is normal – to live in fear of getting killed. But this can’t be normal. To live in cities we have to create places where we have hundreds of kilometers of green ways, where we can have people and bicycles on the streets. So you can crisscross the city in all directions without cars. It will take us a few hundred years to correct them, but this will change at the moment we realize that what we have today is completely crazy. That’s not the ideal we should have for humans in the future. The mayor of São Paulo is being criticized for building hundreds of kilometers of cycle paths and bike lanes. Which advice would you give to Fernando Haddad, mayor of São Paulo, or to any other mayor that seeks daring changes and faces strong opposition? EP: What the Mayor Fernando Haddad is doing is very valiant. One of the most important ideological and political issues of our time is how to distribute road space. Road space is the most valuable asset a city has. We could find oil or diamonds on the ground in São Paulo but it will not be as valuable as road space. How should we distribute road space among pedestrians, bicyclists, public transport and cars? Road space belongs equally to all members of society, regardless of if they have a car or not – it belongs equally to somebody in a road race or a child with a bicycle. So this is a matter of democracy. Who decided we should give more space to cars than to people? Who decided we should give space to park the cars? We should remember that parking is not a constitutional right. The Government has no obligation to provide space for parking, so I think this is a very interesting and democratic discussion. When we implemented our bikeways there were just a few cyclists. Almost no people used bicycles. We have about 3,000 people using bicycles every day. We must remember that even in a giant city like São Paulo more than half of the people have daily trips that are less than 5 km long, so it is very possible that, in a couple of decades, we can have 20% of the population using bicycles – it is not possible in one year or two but maybe in 20 years. We have to remind people with cars that they have no more rights of road space than people who do not have a car. What have you learned being a mayor? EP: When I was mayor we had to completely change the city model. Nobody believed in what we were doing. Many of those things we created now seem very obvious. Now, everybody agrees that we should have big sidewalks, bike lanes, that you give priority to buses on the road. So I learned that we have to find more ways to communicate better to the citizens, to explain things better to the citizens to get them to participate more. To be a good mayor you need to have dreams, to have love for what you are doing. To be a good mayor you have to be very concerned with equality. In our time, we have adopted private property and the market as the best way to distribute most of society’s resources. The inevitable result of this is income inequality. To make a city for people is to make a city where everybody is equal, where nobody is in fear or exploited. To be a good mayor, sometimes you have to make decisions that are unpopular. You have to convince people that in the end it will be good for the city. What is the phrase or the idea you want to spread to the world? EP: You cannot define a transport system, although you know what kind of city you want. Cities are the most important thing we are doing in our time. When we are defining a city, we are defining our way of life. In modern life, different from years ago, people spend less and less time at home and more time in activities outside their home. So cities are more important for human happiness than ever before. A city should be a fun place. It should be a place from which people don’t wish to escape. We have to make cities where people will be very happy in public spaces. A city should promote happiness. This article was originally published in Portuguese on EMBARQBrasil.org.